International Telecommunication Union (ITU), the United Nations specialised agency for information and communication technologies or ICTs, released a report on September 18, Identifying the Potential of New Communications Technologies for Sustainable Development. The report was prepared by The Broadband Commission for Sustainable Development&apos;s Working Group on Technologies in Space and the Upper-Atmosphere. The Broadband Commission for Sustainable Development was established in 2010 and comprises more than 50 leaders from across a range of government and industry sectors who are committed to actively supporting countries, UN experts and NGO teams to fully leverage the huge potential of ICTs to drive national SDG (Sustainable Development Goal) strategies in key areas such as education, healthcare and environmental management. More than half the world&apos;s population remain unable to connect regularly to the Internet. The Working Group&apos;s report states that new space-based and upper-atmosphere technologies, including high throughput satellites (HTS), massive non-geostationary satellite orbit (NGSO) constellations, and high-altitude platform stations (HAPS) systems can help address this challenge, by bringing reliable broadband connectivity across the globe, including to the hardest-to-reach corners of the Earth. Space-based and upper-atmosphere technologies have evolved dramatically in the last decade, in capacity, cost and reach. The report notes that while satellites have long been a part of the telecommunications ecosystem, recent technological innovation and an explosion in capacity has enabled them to play a key role in emerging broadband markets. Similarly, recent developments in HAPS have made that technology a promising way to provide quick deployment and cost-effective coverage across entire regions, focused on backhaul operations in support of mobile broadband systems. The report highlights the evolution that has happened at each component level of space-based and upper-atmosphere communications technologies. Improved power generation and storage, combined with efficiencies in propulsion and control systems have made greater power available for satellite payload operations. Advancements in aerial platforms, battery technology, lightweight composite materials, autonomous aviation and solar technology are opening new opportunities for HAPS. Simultaneously, transmission and reception technology at both ends of the communication path have developed enabling system operators to do even more with their input resources. Innovative network designs have caused breakthroughs in the capacity, capabilities, and service quality of space-based and upper-atmosphere technologies. 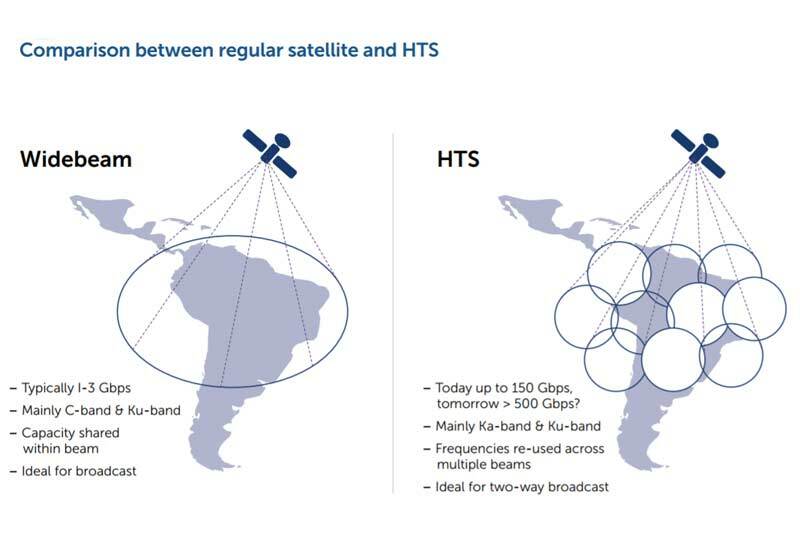 In the case of satellites, some of the most significant advances in services have evolved from the development of HTS, which leverage multiple, narrower spot-beams from satellites in geostationary orbit to increase frequency reuse and deliver exponential growth in system capacity. In addition, massive constellations of hundreds of NGSO satellites in low-earth orbit (LEO) are being planned and manufactured that, when fully deployed, will cover the globe in low-latency, high-bandwidth capacity. These advances in technology will also allow solar-powered HAPS to provide cost-efficient and high-speed broadband to underserved markets, while providing tens of gigabits of backhaul capacity. These new technologies feature substantial increases in capacity compared to their predecessors. And many of these systems are coming online simultaneously. According to the report, over 100 HTS systems will be in orbit by 2020-2025, delivering terabytes of additional capacity. This does not account for multiple NGSO constellations in development. The introduction of HAPS may see thousands of platforms deployed in previously unserved and underserved areas. Traditionally, space-based and upper-atmosphere technologies have been perceived as costly solutions. All of the above is driving down costs, making space-based and upper-atmosphere technologies more accessible than ever before. The price per gigabit per second (Gbps) of throughput has dropped continuously for the past decade and will continue to do so. Satellites have the ability to provide global, ubiquitous coverage and reach where terrestrial-based broadband is not economically viable or very hard to deploy, including sparsely populated and geographically challenging areas. Using small mobile and fixed user terminals, satellites can bring broadband services across the “last mile” directly to individual users. Deployment costs in wired broadband systems rise dramatically as population density decreases, whereas capital expenditure for space-based and upper-atmosphere technologies is largely independent of user density. In combination with smaller wireless or wireline networks, these technologies can also provide backhaul links connecting remote networks to the global Internet. Moreover, because of its flexibility, accessibility, and range of capabilities, high-speed satellite broadband is often preferred not just by rural users who face limited terrestrial alternatives, but also by urban users whose demands for very high speeds and high capacity may not be fulfilled by the available terrestrial infrastructure. The broad geographic coverage of satellites and HAPS systems mean that once deployed, connectivity flows immediately and indefinitely. Broadband is accessible from any ground terminal in the coverage area. In addition to facilitating largescale simultaneous broadband rollout, this also allows for rapid extensions of connectivity during events that require it, including one-time civil needs abd natural disasters. Satellites are immune to the risks of accidental damage, theft, conflict areas and natural disasters, which threaten terrestrial networks and they are designed for continuous operation. Satellites are designed with multiple layers of redundancy, giving nearly 100% uptime. In the unlikely event that one satellite does fail, multiple spare satellites are immediately available, preventing service interruption. On top of that, satellite systems are designed for lifetimes of 20 years or more, allowing for longer deployment and support of equipment. Finally, the carbon impact from satellites is nearly zero once deployed, in light of developments in solar technology and electric propulsion. Reusable launch vehicles could further reduce the environmental impacts of satellite operations. HAPS, which already require very limited amounts of power to operate, are designed to take full advantage of solar-power and be entirely reusable. The report also says that 5G will need to be an ecosystem of technologies – a network of networks – with satellites and HAPS filling key roles to enable the entire system. The ubiquity and capacity of satellite coverage means it will be an important component of 5G networks, working together with terrestrial fixed and mobile systems.